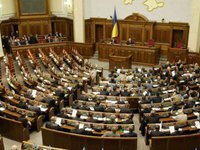 On Thursday, the Verkhovna Rada passed at second reading bill No. 8044, amending to the Budget Code of Ukraine on the implementation of medium-term budget planning, which introduced three-year budget planning. An Interfax-Ukraine correspondent reported that 238 deputies backed the document. "We have been working for three years to consolidate a civilized approach to budget planning in the state. This is the main reform in the field of public finance," Finance Minister Oksana Markarova said, commenting on this decision on the ministry's website. The Finance Ministry said that the adopted bill establishes the rule that state and publicly guaranteed debt cannot exceed 60% of GDP, and the national budget deficit - 3% of GDP. In addition, state guarantees will not exceed 3% of the planned revenues of the general fund of the national budget, and the maximum amount of the national budget deficit in the law on the national budget cannot be larger than the deficit in the Budget Declaration. In the adopted document, the Finance Ministry is responsible for drawing up the Budget Declaration determining the budget policy for the next three years, and annually together with other key spending units updates it and submits the corresponding draft to the Cabinet of Ministers by May 15. The Cabinet of Ministers annually, no later than June 1, by its resolution approves the updated Budget Declaration. The parliament, in turn, may, before July 15, adopt a draft resolution on the Budget Declaration, which will take note of it and/or approve the recommendations of the Verkhovna Rada on budget policy. "The Budget Declaration will contain general marginal indicators of spending and lending, marginal rates of spending and lending to key spending units, as well as an assessment of fiscal risks," the Finance Ministry said. The three-year local financial plans will be the medium-term budget planning tool at the local level, the ministry said. "The adopted bill also provides for the switch to the program-targeted method, when the state finances not just spheres or directions, but the achievement of concrete results in each budget program," the finance ministry said. According to the new rules, when considering the Budget Declaration in the Verkhovna Rada, ministers and heads of other authorities will present their strategic goals and report on their achievements. The main category for evaluating the effectiveness of budget programs and activities of key spending unit will be public services.